I’m not really sure whether you have heard or at the most used ChaCha.com, a question and answer service that provides quick, accurate answers to millions of question everyday. Regardless, you might be interested to know that the online Q&A service is adding some social aspects to its service by launching the new ChaCha.me social platform. The ChaCha.me platform allows you to build a profile. But once your profile is up, practically all those who’ve created their own profiles as well can start asking you various questions. Likewise, you are free to ask questions to them too. It’s like building a social network based on the Q&A format. To kick off its launch, ChaCha.me is featuring David Guetta who recently won a Grammy Award and currently has two songs on the Billboard Top 50. 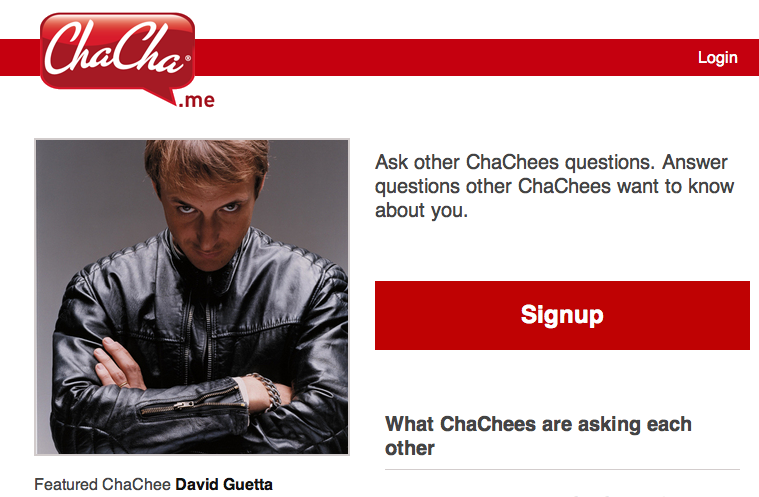 Guetta will be among the first celebrities who will be featured on ChaCha.me. Once on the featured page, fans can ask questions and hopefully get answers from celebrities. In addition, ChaCha.me will soon be making its way on mobile platforms, specifically on iPhone and Droid handsets. An SMS functionality is also being planned. “One of the most fundamentally appealing qualities of social sites like Twitter and Facebook is the notion that people care about what celebrities and friends are doing and sharing. ChaCha.me provides this forum for users, but also takes it to the next level with intimate Q&A interaction. These ChaCha.me answers may flow into ChaCha’s broad database so that those who are asking for answers from ChaCha will receive, in effect, certified answers directly. For example, ChaCha will now be able to return certain answers about David Guetta, directly from David himself,” said Mr. Jones. So last week Facebook won a rather “vague” patent for news feeds. Now, it’s Google’s turn. This time it’s a patent for location based-advertising which if compared with Facebook’s patent is very clear as to what intention Google will use this patent for. Actually, Google may have set the pattern already when it acquired mobile ad company – AdMob. It is clear that Google wants to dominate the mobile advertising market, what with the recent launch of its Google branded phone, the Nexus One. AdSense on the other hand have implemented mobile ad serving a long time ago. And now this patent for location in an advertising system, which is actually the emerging business model for most consumer-facing location startups today. 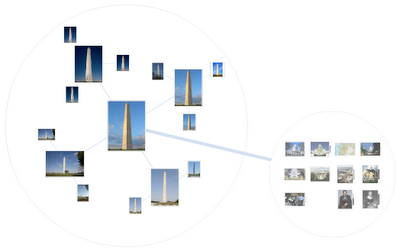 We must also consider Google’s long-standing priority over location-enabled search. In fact, just last week a location filtering option for search was rolled out by Google. 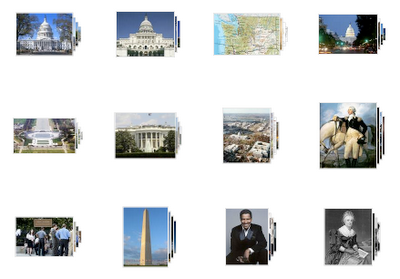 How did we survive without Google Image Search? I frequently use it when someone utters the name of some “celebrity” I’ve never heard of, or I think is actually someone else, to make sure I’m thinking of the right person (like it really matters). Now, not only can we check out similar images of those Z-list celebs, but thanks to a new feature being tested in Google Labs, we could see a whole swirl of related images. Google Image Swirl uses advances in computer vision research to group together a dozen images based on a certain keyword. The “swirl” comes when you click on one of those thumbnails, which expands to show similar and related images based on that image. It’s Google’s own mashup of related images and the Wonder Wheel that you might have used for text-based search queries. It’s interesting to see image search evolve, and presumably if enough people provide positive feedback this will eventually graduate from the labs and become part of the standard Google search. Google’s SafeSearch, while not completely safe (depending on what you define as “safe”, that is) is certainly a great tool for helping to keep kids from viewing inappropriate material online, but it has suffered from being easy to unlock — even without a child actively trying to circumvent it. That’s why Google has just announced an updated version of SafeSearch that requires a password in order to be removed. The look of SafeSearch has changed, so when it’s engaged a set of big coloured Google balls are displayed top-right. This makes it easy for a parent or teacher to quickly see that it’s still engaged. Of course, this is just one thing and won’t block dodgy sites on its own, but it’s a start.